It seems the world has a very convoluted idea of the definition of love. We confess our love for one another in a relationship and make a commitment to love one another “till death do us part” if we go through a traditional wedding ceremony. We make a covenant to one another that our love will be deep and abiding for the rest of our lives. 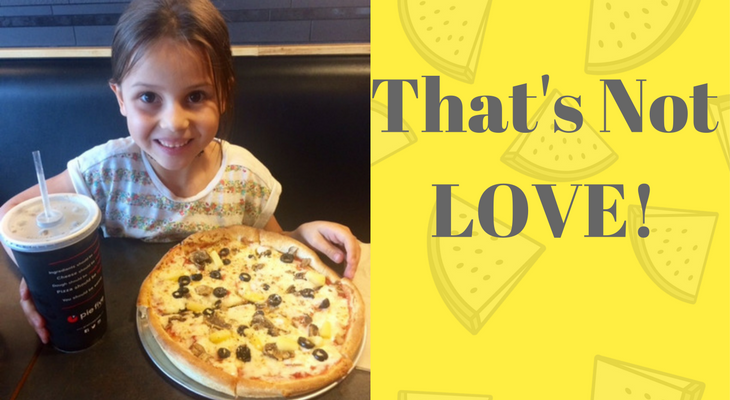 Then we say we “love” pizza. We “love” football. We “love” the beach. Yet if we have a bad experience with any of these “loves” we make a choice not to go eat that pizza again, or watch that football team again or change our vacation habits to the mountains rather than the beach. Our love of things, experiences and events is a shallow kind of love that seems to get confused with a much more lasting love of a relationship. Yet we toss that word “love” around like it’s a frisbee. Carefree and easily undermined. Admittedly I can have a strong affinity to some foods and experiences, even a piece of art or a color. However, to equate that attraction and emotional draw to “love” seems to diminish the real meaning and depth of the word. My love for my husband or my children is a love that can’t be broken by a day of chaos, misunderstanding or exhaustion. My love for a friend goes deeper than my love for a piece of chocolate cake (usually!) The true meaning of the word is to have a deep romantic or sexual relationship with a person. Trust me, I like a good piece of pizza but I’m not going to light candles and caress it or nurture it. I think it’s time we put into perspective what that word “love” means in its truest sense. Perhaps we would be less likely to discard a relationship like we would a stale piece of chocolate cake or a losing sports team. Perhaps we would be more careful how we throw that word around and take more seriously the depth and commitment that being in love truly means. If you’ve forgotten the truest meaning of the word, pull out your Bible and read 1 Corinthians 13:4-7. That piece of scripture explains the depth and emotion behind the word…and will make you want to rephrase your “love” for that juicy steak at your favorite restaurant. I LOVE this. 😉 Really, I agree – this word deserves more respect than what we give it. Bringing commitment and covenant in to the description of love completely changes the dynamic. Then I really, truly love my husband…and I like to eat pizza with no obligations to commit to it forever. Great post! I’m thrilled to be a recipient of your deepest love! Yeah….we take that word seriously in this family. THANKS, Daniel! I think if we took that word a lot more seriously we would be more inclined to watch how we carelessly throw it around. RESPECT words, actions and relationships. Thanks for your comment Ashley. Oh yes, I agree completely. As both a writer, brand developer and a petitioner of consciousness and living deliberately, I am so aware of the importance of the words we choose, and how we use them. I am always diving into the true meaning and origin of words, to make sure I’m truly honoring their meaning and intention. In America, we have diluted so much of the English language. I have taken to saying “I really appreciate”, rather than “love”. I also do NOT appreciate it when people say “I hate”, “I’m dying for…”, and so on. Intentionality with our words is so important. I like your “I really appreciate” response….And I agree that we really don’t pay much attention to using words in their right context. Today I attended a women’s group that talked about Friendship and how carelessly we throw around the word BFF or BEST friend. Does that make other friends feel inferior?! Thanks for the good comment, Jared. Wish our English language was more like the Hebrew and Greek as they have different types of love. You know it is true and lasting love when it is tested in times of sickness, at least that is what I have experienced. Great comment, Regina. You are right. Other languages take their words more seriously and have different words to express their emotions and actions. And, yes, sickness or grief, etc…certainly tests one’s degree of love! Thanks for the comment! Darlene, It’s amazing what pops out of our mouths when we just start talking and don’t really consider the weight of our words. Thanks for your comment, Darlene! Great post! I’m so guilty of tossing around that word. Thank you for bringing it to my attention. I’ll be paying attention to this one. Ha! You made me laugh Holly! I tend to agree……no matter how stale a piece of cake is, the frosting is still the BEST! Glad you liked the post. Thanks so much for the comment.